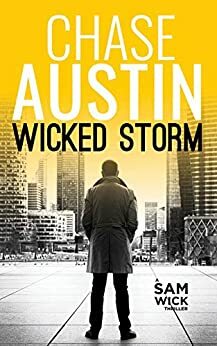 Wicked Storm is the first in a new series of thrillers by author Chase Austin. The story is fast paced and centers around a cage match to the death as part of a human trafficking operation. In the midst of this seedy, savage setting an old man and his young companion enter the fray and join the death match for their human prize. His adversaries scoff and discount their opponent, but Sam Wick is not who he seems to be. Wicked Storm could be considered a short story as it checks in at a little under 50 pages, but Austin does a fantastic job sucking the reader right into the action. While initially there does not appear to be a back story to Wicked Storm, the brilliant twist is that the story itself is the back story and serves as a clever introduction to the main character in the series. Undercover black ops agent and master of disguise, Sam Wick is the guy that the government calls when nobody else can do the job. If you’re not squeamish and are looking for something new to read, I would recommend Wicked Storm as a quick and interesting title. Austin has piqued my curiosity regarding Sam Wick and I am looking forward to the upcoming books in the series. I am hoping that after this initial offering, the upcoming books are a bit longer and more detailed, but I am sure I will enjoy them either way.